Although hand-coloured photographs were originally intended to make monochrome (most frequently referred to as black and white) images look more realistic, today, they are often interpreted as quite the opposite. These photographs are viewed as surreal and unlike contemporary colour photography that we typically associate with more accurate colour. Hand-painted view of Alta Lake, ca. 1930. Philip Collection. 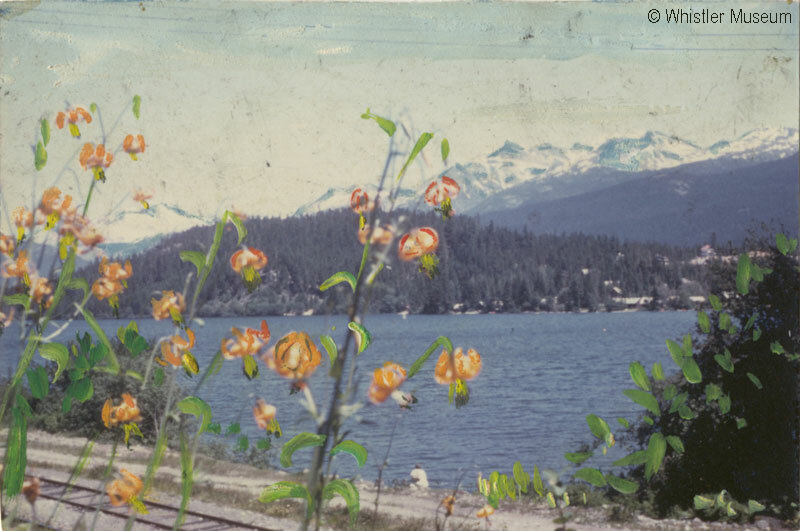 Whistler Museum holds some fascinating examples of hand-coloured photography. For most of these objects, the craftsmanship is far from superior; however, the fact that these photographs exist from such an early Whistler is marvelous in itself. Hand-coloured photographs were most popular from the nineteenth century to the mid-twentieth century – before Kodak introduced Kodachrome colour film. The earliest account of hand-colouring photographs is attributed to Swiss painter and printmaker Johann Baptist Isenring, who began colouring daguerreotypes (one of the first photographic processes) soon after their invention in 1839. Isenring used gum Arabic and pigments to colour his photographs. Typically, watercolours, oils, crayons or other dyes are applied to monochrome image surfaces using brushes, fingers, cotton swabs or airbrushes. 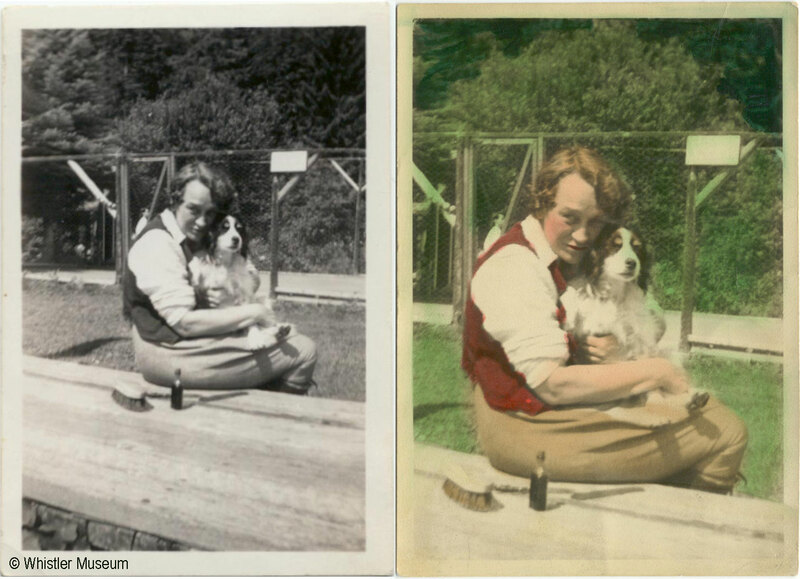 Example of monochrome photograph with and without hand-colouring. Myrtle and Binkie, ca. 1930. Philip Collection. Some particularly interesting and high-quality hand-coloured photographs in our collection are those by photographer Leonard Frank. Frank moved from Germany to North America in 1892 – first to San Francisco and then to our native British Columbia in 1894. At this time he settled in Port Alberni on Vancouver Island, while snapping photographs of locations all over British Columbia. He spent about fifty years here and managed to capture over 50,000 images of our province – and considering the cumbersome photographic equipment of the time, that number is far from slight! Frank would travel through arduous terrain – often on foot – carrying a heavy pack, an 8 x 10 inch Kodak view camera, glass plates and a tripod. Capilano River, ca. 1925. Philip Collection. Aside from the sheer amount of photographs by Frank, his subject matter was also rather widespread. He photographed everything from the peaks of the Rocky Mountains to the coastal whaling industry, from the construction of bridges to remote harbours, from political figures in Vancouver to Whistler’s very own pioneers. Alex Philip takes some Rainbow Lodge guests for a paddle down the River of Golden Dreams, 1941. Philip Collection. What is often withheld in biographies on Leonard Frank is his heavy ties with Whistler. Frank spent quite a bit of time at Alta Lake and he was a frequent guest of Rainbow Lodge. 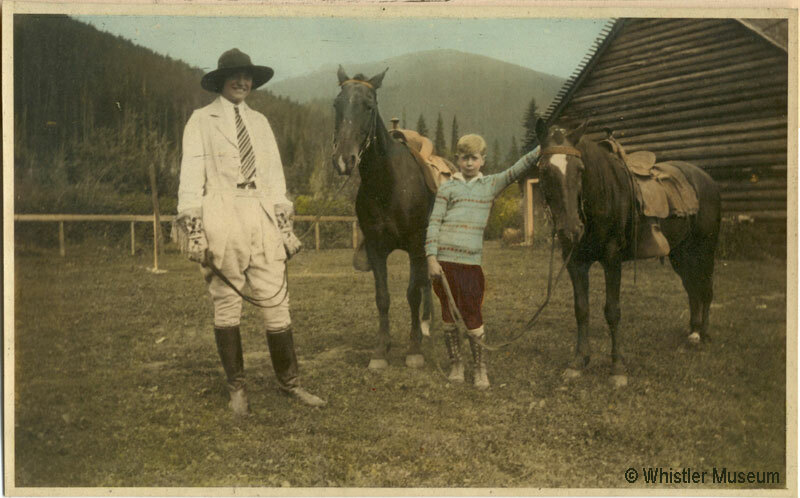 Furthermore, he was a personal friend to Whistler pioneers Myrtle and Alex Philip. Myrtle and guest with horses, ca. 1935. Philip Collection. 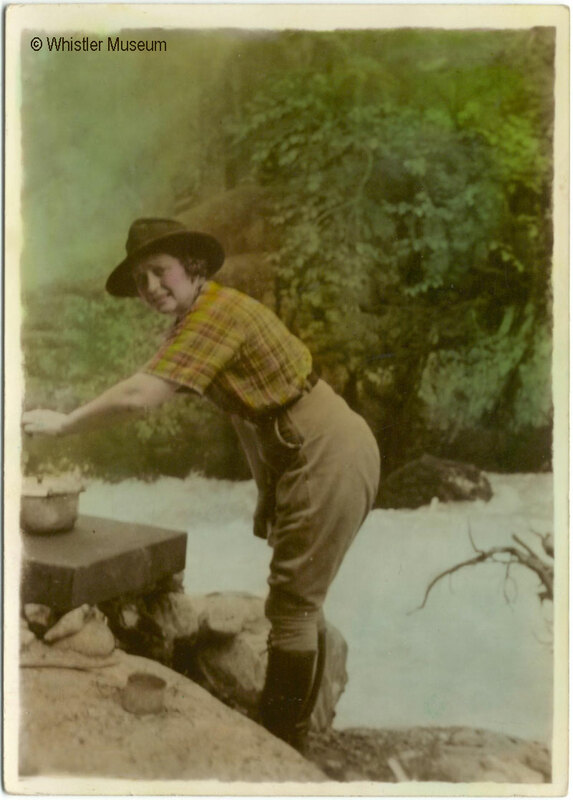 Although tough to know for certain, many of our other hand-coloured photographs in the collection are presumably the craftsmanship of our very own Myrtle Philip, as she frequently dabbled in amateur photography. Myrtle cooking beside a river, ca. 1935. Philip Collection. 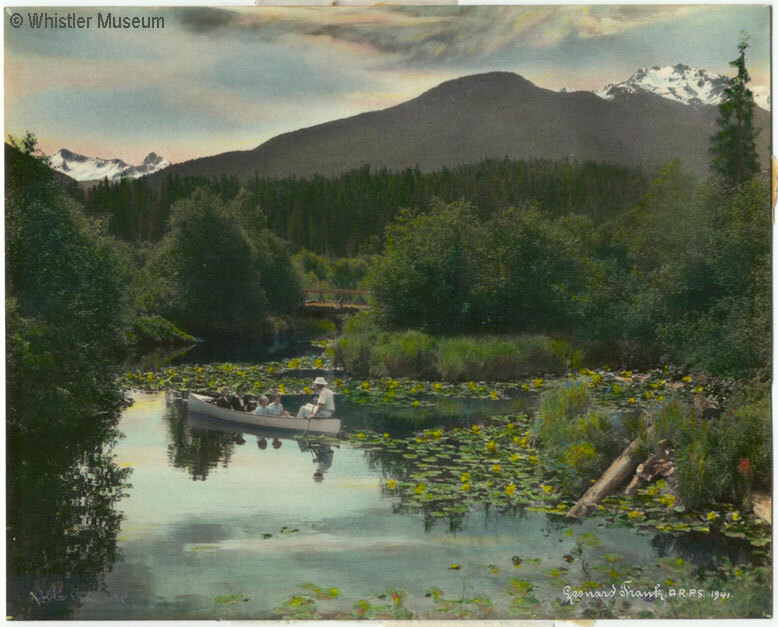 While all of these images present the idyllic landscapes and pioneer life of Whistler’s past, they also showcase the skill of one of British Columbia’s earliest professional photographers, the variety and uniqueness of hand-colourists, as well as this fascinating time in photographic history. 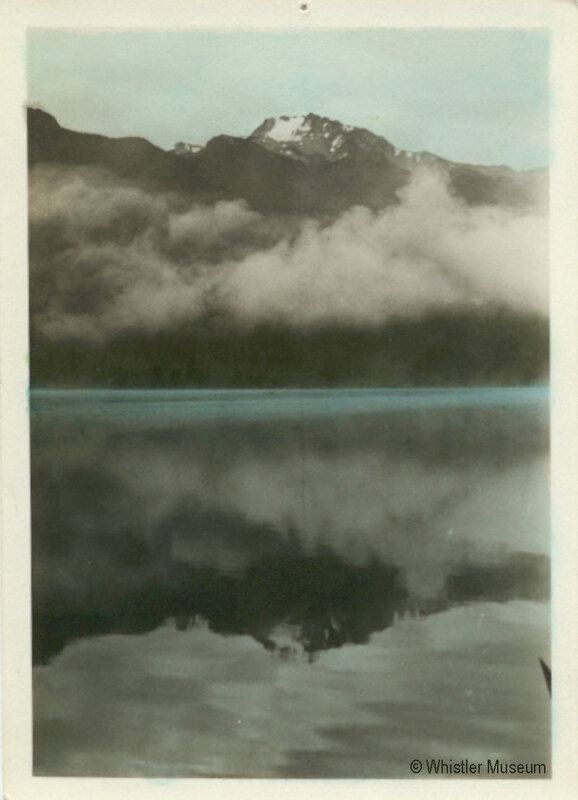 Whistler Mountain reflected in Alta Lake, ca. 1935. Philip Collection. 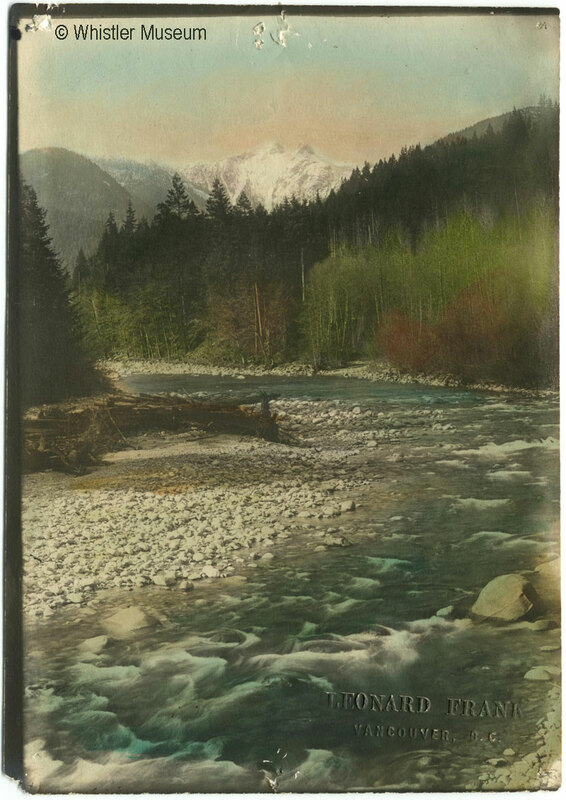 This entry was posted in Pioneers and tagged hand tinted photography, history, photographic history, Pioneers, Whistler. Bookmark the permalink.